- Pour gelatine into ¼ cup of Grand Pré UHT milk and let stand for 5 minutes. - Meanwhile, pour remaining UHT milk in a large saucepan. - Add into saucepan the UHT milk/gelatine mix. - Then add the powdered milk and mix (at low speed) with a beater or a whisk. - Place saucepan on cook top and stir over low heat until it reaches 82°C (180°F). - Then let stand until the temperature drops to 42°-44°C (108°-112°F). For more efficiency, use a yogurt thermometer. - Take from saucepan, 1 cup of lukewarm milk in which you will add (using a fork) the envelope of yogurt starter. Dissolve completely. Then pour back into saucepan and mix well. - Transfer into container making sure to follow your yogurt maker’s specific instructions and incubate 4 to 4.5 hours. - Finally, refrigerate container for 8 hours. 1- Pour gelatine into ¼ cup of Grand Pré UHT milk and let stand for 5 minutes. 2- Meanwhile, pour remaining UHT milk in a large saucepan. 3- Add into saucepan the UHT milk/gelatine mix. 4- Then add the powdered milk and mix (at low speed) with a beater or a whisk. 5- Place saucepan on cook top and stir over low heat until it reaches 82°C (180°F). 6- Then let stand until the temperature drops to 42°-44°C (108°-112°F). For more efficiency, use a yogurt thermometer. 7- Take from saucepan, 1 cup of lukewarm milk in which you will add (using a fork) the envelope of yogurt starter. Dissolve completely. Then pour back into saucepan and mix well. 8- Transfer into container making sure to follow your yogurt maker’s specific instructions and incubate 4 to 4.5 hours. ** It is very important to bring temperature up to 82°C (180°F) since the powdered milk and the gelatine did not go through the same pasteurization process as the Grand Pré UHT milk. However if you don’t add any other ingredients, a maximum temperature of 42°-44°C (108°-112°F) is sufficient. 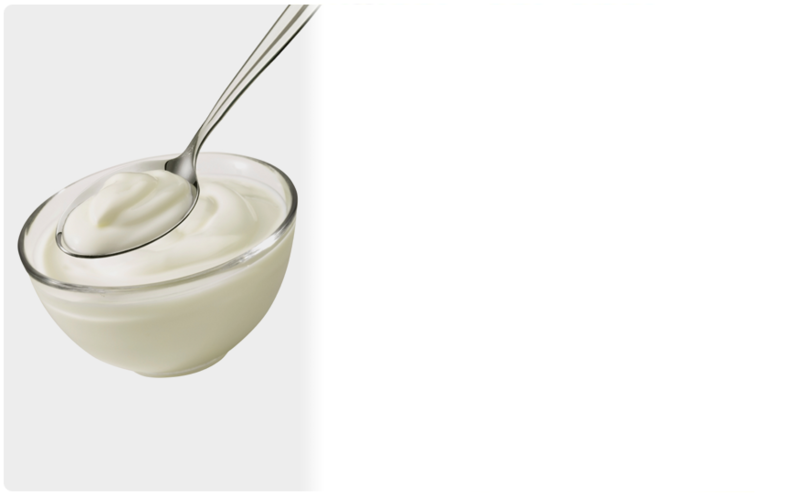 ** This yogurt can easily replace sour cream in any recipe. ** To obtain an accurate reading of the milk temperature, keep the thermometer in the milk for at least 30 seconds. Conservation: 3 to 4 weeks.